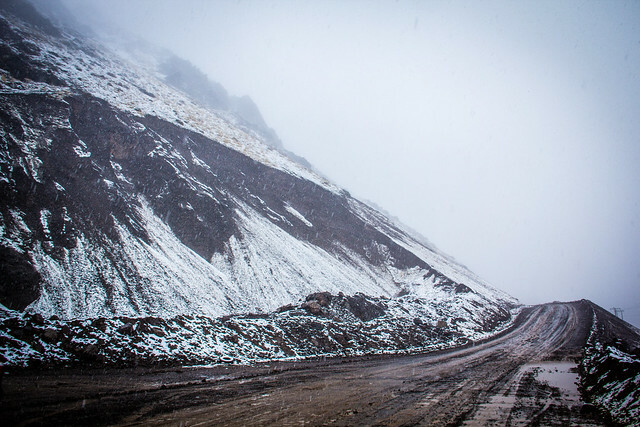 Ascending gradually up the steep, narrow cliff roads of Cajon del Maipo, or Maipo Canyon, is enough to put anyone on edge, especially when the gravelly ‘roads’ start to turn to icy snow. 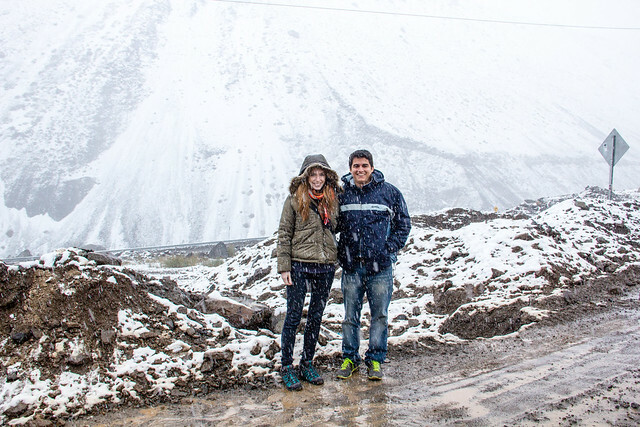 Just two hours drive outside of Santiago and you’re standing a few centimeters deep in the fluffy mountain snow of the El Yeso Reservoir; over 3000 meters above sea level. El Yeso is a vast reservoir, about 20km west of the Argentinian border and surrounded by snowy peaks that reach up to 5,000 meters. The route G-455 ends a further 18km from El Yeso at the hot springs, Termas del Plomo which you can see on the map below. Driving the G-455 towards El Embalse del Yeso from the entrance at Romeral (~73km from Santiago), is one of the most scenic and impressive drives I’ve experienced so far (though I have yet to take the road from Santiago to Mendoza!). It’s definitely wise to use a car to get here (although we saw a few brave souls struggling to cycle up the snowy roads), especially if you intend to go all the way to the reservoir or hot springs. The narrow, winding mountain roads frequently verged on ‘nerve-wracking’, as the dramatic drops to the canyon floor a few hundred meters below caused my heart to jump to my mouth a few times. 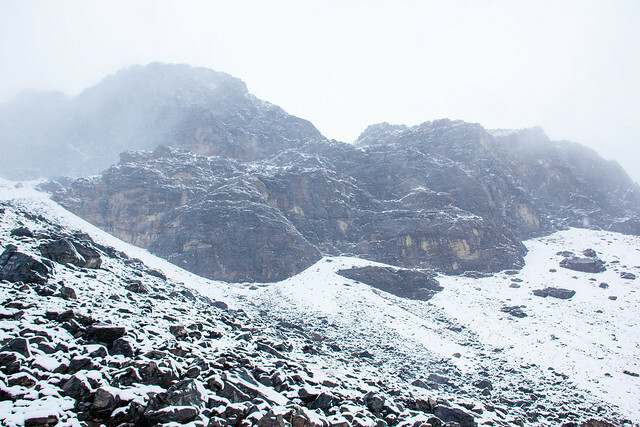 Going in late April or early May, the last few hundred meters of the route were already submerged in snow, while strong winds constantly blew falling snowflakes in our eyes. Visibility can be quite low at times so always drive slowly and watch out for cars coming in the opposite direction, making their way back down the mountain. 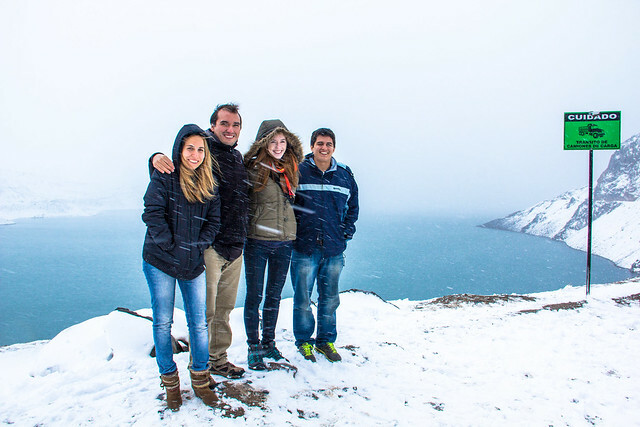 Honestly, we were completely unprepared for the trip, as we were only invited by Andres’ cousin the previous day. We definitely weren’t expecting snow, or such low temperatures, although Santiago has been getting gradually colder since we arrived. Luckily that morning, I decided to break in my brand new Merrell walking boots, courtesy of the lovely people at Blacks.co.uk, and they certainly served me well through rain, snow, ice and rock. Like walking on a cloud, albeit a cloud with very good support, my feet were completely comfortable, warm and safe from water during the entire trip. 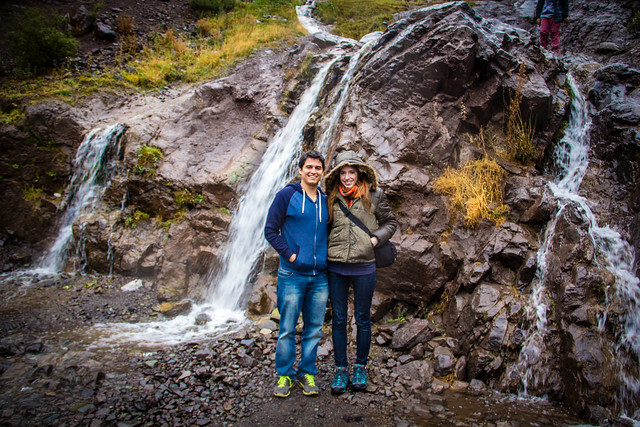 What else can you do in Cajon del Maipo? 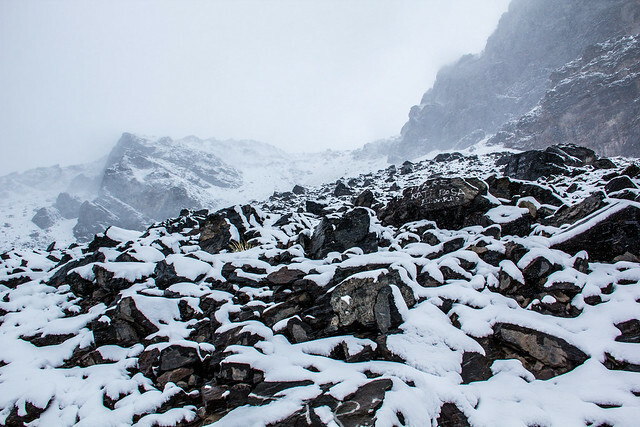 There are some serious trekking routes in Cajon del Maipo that will take you all the way to the Argentinian border, but you need to be a pretty experienced trekker to attempt some of the trails here. 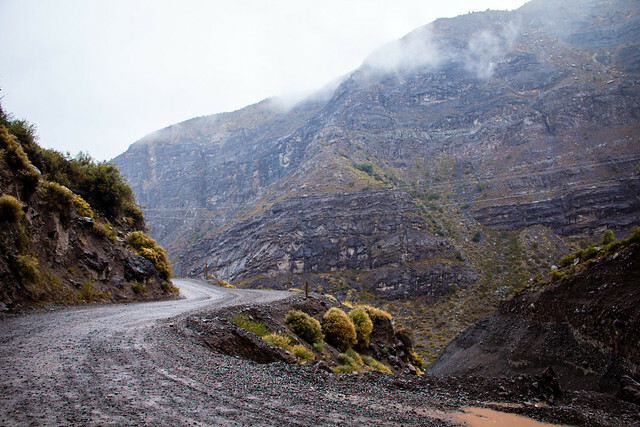 There are lots of local companies who can guide you through the canyon in safety, many of which can be found on the official Cajon del Maipo site (en Español). We saw lots of people white water rafting with GoPro’s stuck to their helmets further down the river, while you can also go canyoning, skiing and horse-riding in various other parts of the canyon. Windsurfing and fishing are also possible in the Yeso Reservoir, although we saw no signs of any water activities in the area. Perhaps it is only during summer months. 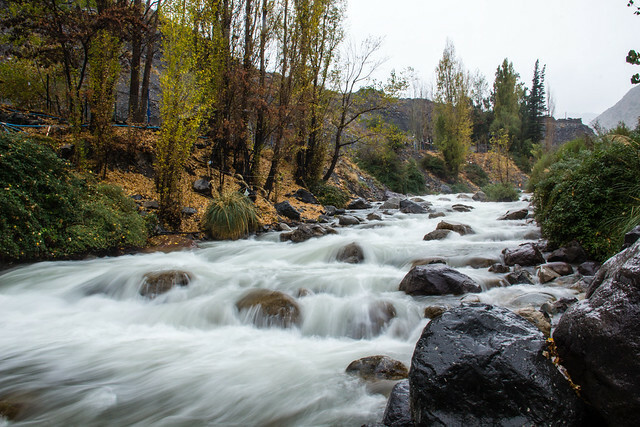 Even in the beginning months of winter, we noticed a lot of people camping in the flatter grounds of the foothills, bearing the damp conditions for the chance to experience some of Chile’s renowned outdoor activities. 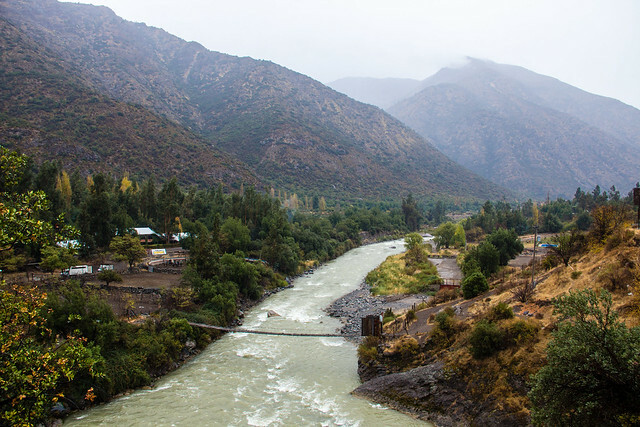 If you do decide to camp in Cajon del Maipo, you’ll never be too far from a hot meal, as the beautiful sleepy town of San José de Maipo is one of the first towns you’ll encounter on your way out of the canyon. 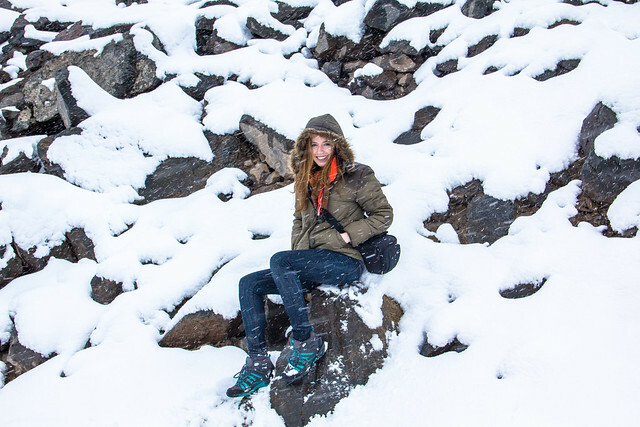 What a beautiful winter hike! Loved your photos and post. Nice! We’re also in Santiago and I was researching day trips to take from here when I stumbled upon your post (on Triberr). 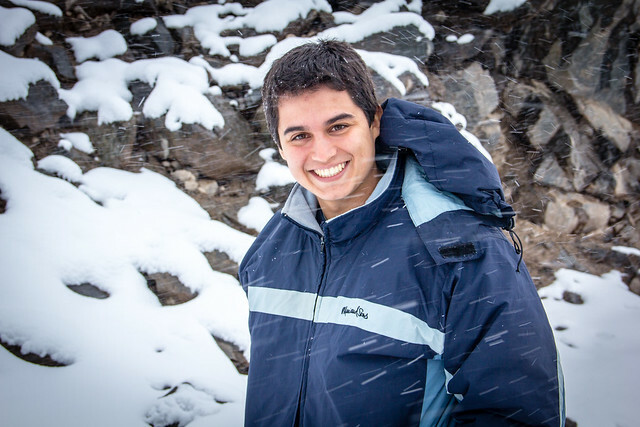 Hi Steph-Andres, Good to see both of you enjoying at Chile and Thanks for giving us such nice pics. I love the pic second from bottom. Peter recently posted..Coral World Ocean Park offers a variety of activities for visitors or all ages. Hope you accept the award and pass on the blogger love! Amazing place for visit. nice clicks. its seems to be lots of fun. thanks for posting nice views. It must be freezing out there. 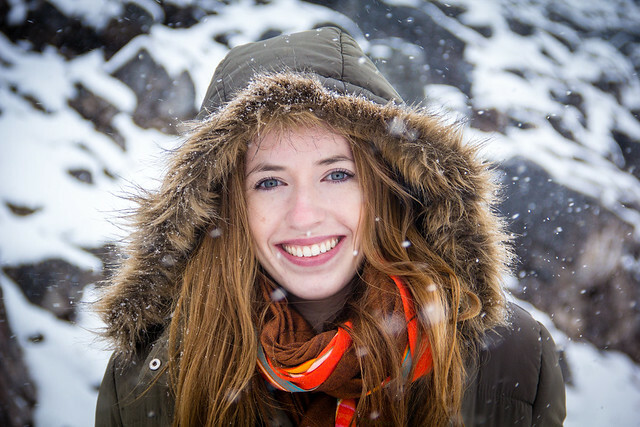 Well although it’s already in late Autumn, the photos shown how cold that place is and I’m sure that will be an awesome getaway from a hot temperature of tropical places in many countries. Cajon del Maipo looks really very interesting to me especially at this season. Maybe I can experience that soon with the whole family. Thanks for sharing! Looks like a great place which I missed on my stay in Chile! Feel like visiting this great country again! Hi Hung, thanks for commenting!